36 1/2 (39, 42, 45, 48 1/2, 52)" bust circumference. Pullover shown measures 36 1/2", modeled with 4 1/2" of positive ease. Finished Size 36 1/2 (39, 42, 45, 48 1/2, 52)“ bust circumference. Pullover shown measures 36 1/2”, modeled with 4 1/2” of positive ease. Yarn Manos del Uruguay Serena (60% alpaca, 40% cotton; 170 yd 155 m/1 3/4 oz 50 g): #2680 sea urchin, 4 (5, 5, 6, 6, 7) skeins. Yarn distributed by Fairmount Fibers. Needles Body—sizes 3 (3.25 mm) and 5 (3.75 mm): straight. Neckband—size 3 (3.25 mm): 24” circular (cir). Adjust needle size if necessary to obtain the correct gauge. 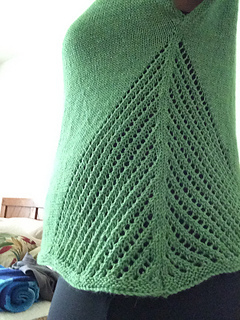 Gauge 25 sts and 33 rows = 4” in St st on larger needle. 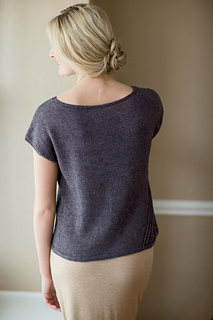 Alpaca gives the Driftwood Tee beautiful drape, while cotton lends it body and breathability. 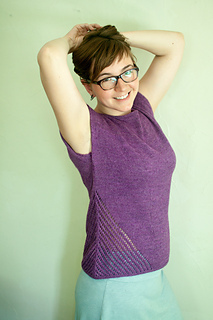 A geometric lace panel on both front and back adds visual interest to a simple piece.